In December, food media tends to emphasize complicated recipes for sweet and buttery treats and desserts. I’m all for holiday baking (and will post some recipes that contain seasonal fruits later), but wanted to offer the alternative of a simple baked yam, naturally colorful and sweet. 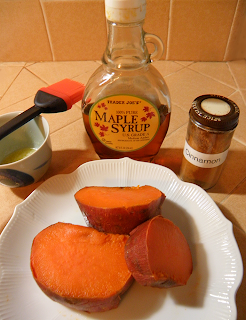 Although my recipe contains sweetener (maple syrup) and butter, the amount compared with the vegetable is low. Since butter and syrup are served as “add your own” condiments, each diner can add the amount they like. My husband doesn’t even use the syrup. He says the yam is sweet enough without. Some people like to sprinkle with cinnamon, so I’ve added that as an optional condiment. I’ve heard that some people like brown sugar, instead of the maple syrup. I like to offer the butter melted in a small dish with a silicone basting brush for serving. To conserve planetary energy, I do “bakes” where I cook several things in the oven at the same time. I especially like this in winter, when the heat from the oven also warms the house. So, I put the yams in at 400 degrees for 45 minutes by themselves, then put in some turkey thighs to roast for 15 minutes, while yams finished cooking. When I took out the yams, I lowered the heat to 350 degrees and popped in a parsnip-carrot casserole (I’ll post recipe by next weekend). The turkey and the casserole cooked together for just under an hour at 350 degrees. Not only does this strategy conserve energy, it also makes/bakes your entire meal. You can even pop in a simple dessert like baked apples or apple cranberry crisp at the end of your “bake.” Another conservation-minded strategy, if you’re only baking yams, is to cook the yams in a toaster/convection oven . A couple notes about the baking dish: some cooks put the yams right on the oven racks, but since it’s likely they’ll leak, I don’t recommend it. To facilitate cleaning of the baking dish, put water in it to soak it as soon as it’s cooled. Otherwise, carmelized sweet potato can require a lot of unnecessary muscle to clean off the dish. It’s an individual preference how soft to cook a yam, as noted in recipe. We cooked ours for one hour and they were quite soft, which is how we like ‘em, so they can be mashed up easily with the butter and syrup. Preheat oven to 400 degrees F. Wash yams with vegetable brush. Put in baking pan. Bake for 45 minutes and poke with fork to see if they’re a soft as you like them. Test each yam because they can vary in density and cooking time. 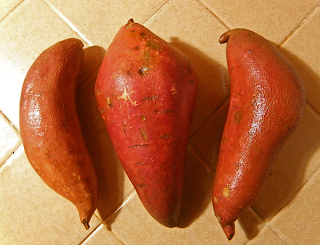 Larger yams and thicker sections of yams will take longer. My standard cooking time is 1 hour. Continue baking 15 minutes, and test yams again. 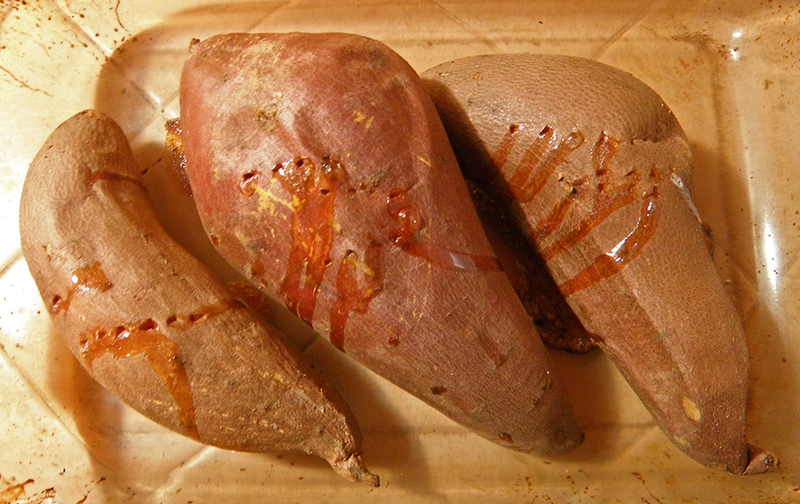 Most yams will be done by now (1 hour), but if not, bake another 10 minutes or so.